The ground may be covered in snow, but New York farmers already have their minds on growth. Agricultural producers from across the state are meeting in Syracuse Jan. 19-21 as part of the 2016 Empire State Producers Expo. The three-day showcase brings together Cornell scientists and Cornell Cooperative Extension specialists to share the latest in research and technical advances, from crop management and food safety compliance to the best practices to aid the industry’s newest farmers to those working the land for generations. 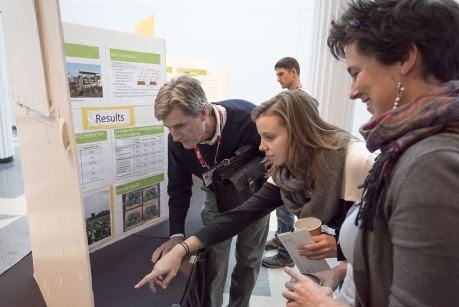 New York agriculture is at a point of ascendency, said Kathryn J. Boor, the Ronald P. Lynch Dean of the College of Agriculture and Life Sciences (CALS). She said the potential growth for farmers and producers of all sizes is aided by research conducted on the Cornell campuses in Ithaca and Cornell’s New York State Agricultural Experiment Station in Geneva, New York. Geneva, NY. January 21, 2016: Dale-Ila Riggs, president of the New York State Berry Growers Association, knew well the danger when SWD (aka spotted wing drosophila) blew into New York in 2012. This tiny new pest ravished millions of dollars worth of raspberries and blueberries. Now, for her leadership and resolve on behalf of an industry worth $15 million and growing, Riggs has received an Excellence in IPM award from the New York State Integrated Pest Management Program (NYS IPM) at Cornell University. 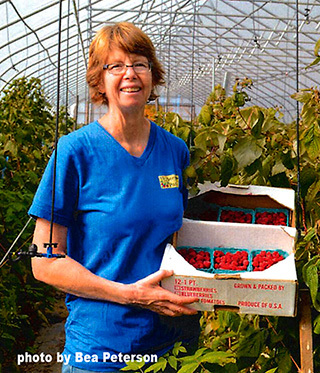 As a former Cornell Cooperative Extension (CCE) educator and professional IPM scout who monitored dozens of vegetable and berry farms for pests as well as the beneficial insects that help keep pests in line — not to mention her experience on the 240-acre berry and vegetable farm she and her husband run — Riggs has decades of practical knowledge under her belt. But with a formidable pest as destructive as SWD, dealing with it takes relentless advocacy and careful research. Cornell weed scientist Toni DiTommaso. Nassau County assistant district attorney Renè Fiechter. Farmer, advisor, inventor, pioneer and frequent IPM research collaborator Lou Lego . Long Island-based Cornell Cooperative Extension vegetable specialist Sandra Menasha. Cornell entomology professor John Sanderson. Member of Cornell’s Government Affairs office Lee Telega. Broccoli is just one manifestation of a truly amazing plant, Thomas Björkman tells Surprisingly Awesome podcast hosts Adam Davidson, a New York Times Magazine economics columnist and co-founder of NPR’s Planet Money, and Rachel Ward. If you’ve gotten shut out in years past because Camp Mushroom sold out before you even heard about it, now’s the time to sign-up for the annual event which will be held June 3 – 4 at Hidden Valley Camp, Watkins Glen NY. Camp Mushroom is Cornell University’s annual two-day event for farmers, woodlot owners, and hobby growers who want to cultivate their own shiitake, oyster, lions mane, and stropharia mushrooms. This year marks the 11th year of the course, as forest mushroom cultivation blossoms in the Northeast as a new small farm industry. This course is geared for those interest in the commercial production of mushrooms. Participants will be trained in four methods of mushroom cultivation; shiitake on bolts, lions mane/oyster on totems, oysters on straw, and stropharia in woodchip beds. Additional topics include laying yard and management considerations and the economics of production. Each participant will also inoculate a shiitake bolt to take home. Anyone who wants to get into mushroom growing as a serious pursuit should not miss out on this opportunity to learn from the experienced growers and researchers who will present for this event. 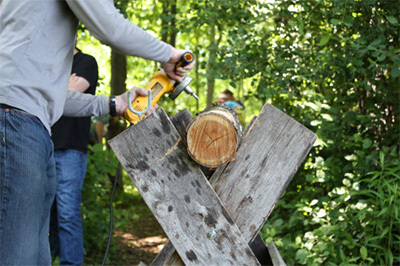 Visit the Camp Mushroom webpage for more details and registration information. Looking for a summer internship? Application deadlines are coming up fast. Summer Research Scholars Program – Based at the New York State Agricultural Experiment Station in Geneva. Undergrads participate in exciting lab- or field-based research projects in Entomology, horticulture, plant pathology/plant-microbe biology or food science. 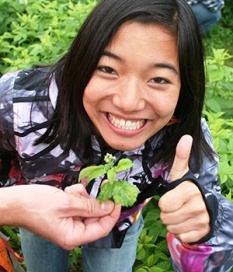 Cornell Plantations internships – Interns become a member of the Plantations’ professional team and work with staff in natural areas, wildflower garden, botanical garden, youth education programs or marketing and communications. Campus landscape internships – Work with Nina Bassuk and the staff of the Urban Horticulture Institute to plant and tend Minns Garden and other campus landscapes and assist in research at Bluegrass Lane Turf and Landscape Research Facility. Organic Vegetable Farming Research Assistant – Get applied research experience on campus and at the Thompson Research Farm in Freeville. Help manage vegetable crops from planting to harvest, learn plant and soil sampling methods, organize data, and summarize results. Plant Genome Research internships – An incredible opportunity to work side-by-side with experts at the Boyce Thompson Institute in the fields of biology/biochemistry, biotechnology, genetics and development, plant sciences, genomics, and bioinformatics. Annual flower trials/greenhouse technician – Work outside early June to mid-August. Contact koh4@cornell.edu for details. Agriculture and Food Science Internship Hebei Province, China – Conduct field trials and sensory evaluations for fast-growing organic food business in China. Visit the Plant Science Internships blog to view more opportunities. Marvin Pritts, professor in the Horticulture Section of the School of Integrative Plant Sciences, is spending winter break in India, where he is assisting students in the Agriculture Systems Group in the class Agriculture in Developing Nations (IARD 6020 ) along with K.V. Raman in the Plant Breeding and Genetics Section. “There are also groups exploring rural infrastructure, adding value to crops and textiles,” says Pritts. 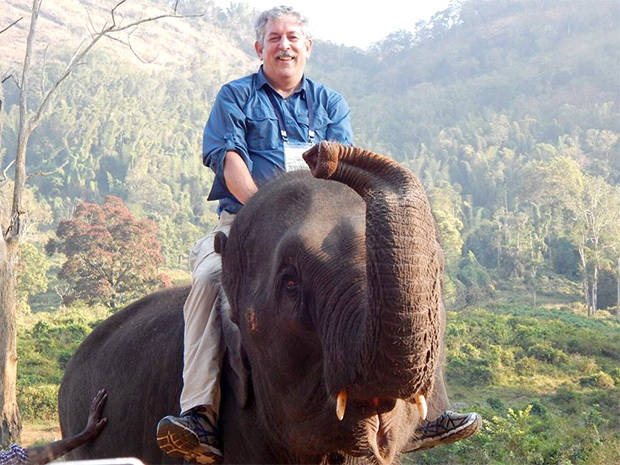 “So it’s quite a complex logistical operation as we all do different activities during the day.” Pritts’s elephant ride came at a working farm sponsored by the Indian government to take care of elephants and provide them with meaningful work. You can view more images on Pritt’s Facebook page. 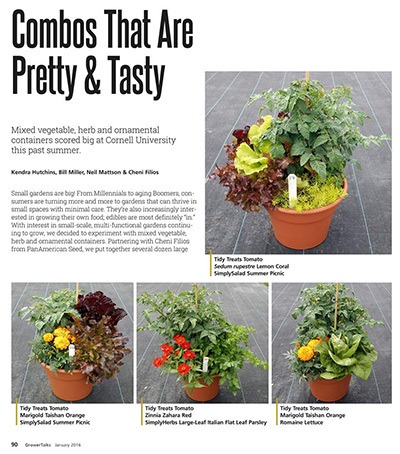 Cornell research on combining edibles, herbs and ornamentals in patio containers is featured in and article in the January 2016 issue of GrowerTalks magazine, a trade magazine serving the greenhouse and garden center industry, starting on page 90. The article was authored by technician Kendra Hutchins, horticulture faculty Bill Miller and Neil Mattson, and Cheni Filos MS ’14, production line manager at PanAmerican Seed. More information about the trial and additional pictures are available on the Bluegrass Lane Annual Flower Trial website. Mattson was also featured in a recent article in the Ithaca Journal, Is the future of vegetable farming indoors? Some of Mattson’s research is helping ornamental growers make use of their greenhouses in the late spring and summer after gardeners and landscapers have bought up the inventory. “Growing vegetable crops during those unused times of the year is a good way to have revenue during times when they otherwise wouldn’t have revenue,” Mattson said. A new video from the USDA’s Sustainable Agriculture Research and Education (SARE) program features Cornell’s Soil Health Program, based in the Soil and Crop Sciences Section of the School of Integrative Plant Sciences. The video also features Donn Branton, a cooperating farmer in Le Roy, N.Y., who has worked with van Es and the Cornell Soil Health Team, and Bianca Moebius-Clune, former coordinator of the Cornell Soil Health Program who is now director of USDA-NRCS’s Soil Health Division. Special kudos to Jenn Thomas-Murphy, an Extension support specialist in the Soil and Crop Sciences Section, who shot and edited the video. See also: Innovative Assessment Helps Farmers in the Northeast Improve Soil Health at the SARE website. If you were concerned about the fate of the murals on the first floor of Plant Science Building damaged during construction of the new teaching labs, don’t fret. 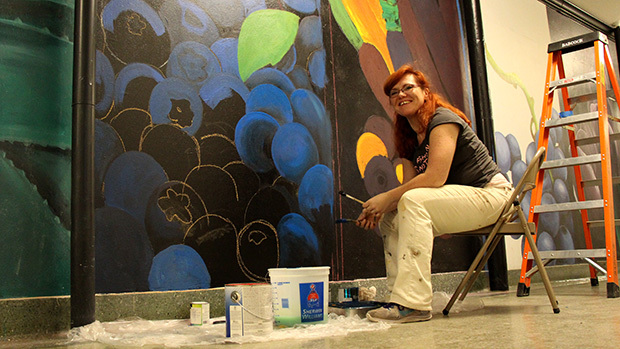 The original artist, Danielle Hodgins ’08, has returned to restore them. Hodgins first brightened up the hallway with a rainbow of painted plants as a senior project in Spring 2008. Since then, she has completed a BFA at Syracuse University and is now working on an MFA at the University of Houston. You may also remember her 2006 project for the Art of Horticulture course: Misty Sue, a larger-than-life sod cow outside of Morrison Hall, a favorite photo spot for animal science majors at graduation that year. Horticulture professor Thomas Björkman is breeding new varieties of broccoli that thrive in the eastern climate. His research as part of the Eastern Broccoli Project could mean fresher, better tasting broccoli grown in New York and other eastern states, reducing the demand for the vegetable grown and shipped from California. 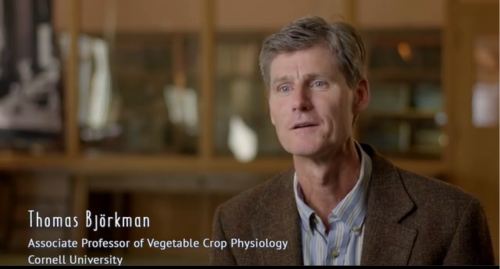 This web exclusive to the PBS documentary In Defense of Food takes a look at Björkman’s research and his effort to create a year-round supply of high-quality, Eastern-grown broccoli.